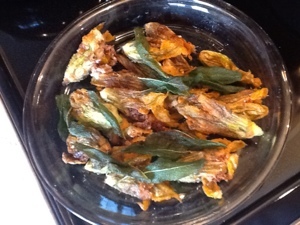 My first attempt at stuffed squash blossoms turned out soooo delicious that it won’t be my last! The stuffing included pork sausage, hamburger, Parmesan Reggiano, onion, sage and one teaspoon mayonnaise. Topped off with fried sage leaves. 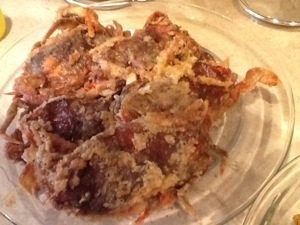 DC Seafood market soft shell crabs in a light dredge with a squeeze of lemon were the stars of the meal. Finally, a garden tomato, basil and feta cheese salad dressed with balsamic and olive oil to cut the richness of the meal. Happy Daddy! Thanks for the wonderful thumbs up! I’ll bookmark your weblog and test again here frequently. I am somewhat certain I will be informed lots of new stuff right right here!